Dry Tortugas National Park is a national park in the United States about 68 miles (109 km) west of Key West in the Gulf of Mexico. 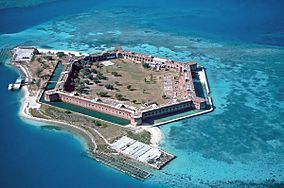 The park preserves Fort Jefferson and the seven Dry Tortugas islands, the westernmost and most isolated of the Florida Keys. The archipelago's coral reefs are the least disturbed of the Florida Keys reefs. The park is noted for abundant sea life, tropical bird breeding grounds, colorful coral reefs, and legends of shipwrecks and sunken treasures. The park's centerpiece is Fort Jefferson, a massive but unfinished coastal fortress. Fort Jefferson is the largest brick masonry structure in the Western Hemisphere, and is composed of more than 16 million bricks. Among United States forts it is exceeded in size only by Fort Monroe, Virginia and Fort Adams, Rhode Island. Dry Tortugas is unique in its combination of a largely undisturbed tropical ecosystem with significant historic artifacts. The park is accessible only by seaplane or boat and has averaged about 63,000 visitors annually in the period from 2007 to 2016. Activities include snorkeling, picnicking, birdwatching, camping, scuba diving, saltwater fishing and kayaking. Dry Tortugas National Park is part of the Everglades & Dry Tortugas Biosphere Reserve, established by UNESCO in 1976 under its Man and the Biosphere Programme. The Dry Tortugas is a small archipelago of coral islands about 70 miles (110 km) west of Key West, Florida. They represent the westernmost extent of the Florida Keys, though several reefs and submarine banks continue westward outside the park, beyond the Tortugas. The park area is more than 99 percent water. The seven major islands, all within the park, are, roughly from west to east, Loggerhead Key, Garden Key, Bush Key, Long Key, Hospital Key, Middle Key and East Key. The park is bordered on the east, south and west by the Florida Keys National Marine Sanctuary, and on the northwest by the Tortugas Ecological Reserve. The total land area within the park is 104 acres (42 ha). The park is in a tropical maritime climate, with rainy seasons coinciding with hurricane season from May to October, and a drier season from November through April. The area is heavily influenced by frequent hurricanes and tropical storms. Even with exposure to tropical systems the Tortugas are among the driest places in Florida, with an annual precipitation of about 49 inches (120 cm). There is little temperature variation, with high temperatures in summer around 90 °F (32 °C) and low temperatures in winter around 66 °F (19 °C). Visiting the park by private boat is difficult because of its distance, so most visitors come by ferry or seaplane from Key West. Official ferry and transportation services to the Dry Tortugas includes the Yankee Freedom III catamaran and seaplane services. The Dry Tortugas are the western extension of an arcuate chain of Pleistocene reef and oolitic limestone islands, with the eastern limit in the vicinity of Miami. These Florida Keys are the surface expression of the 6 km thick southern Florida carbonate platform, which has been accumulating sediments since the Early Cretaceous. Two stratigraphic units are exposed at the surface, the Key Largo Limestone and the Miami Limestone. The Key Largo Limestone are reefs up to 60 m thick, parallel to the shelf edge, consisting of hermatypic corals and calcarenites. 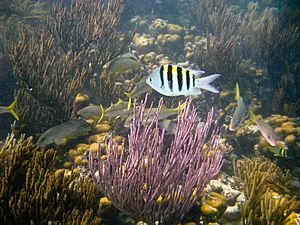 The Miami Limestone is less than 15 m thick, and in general, is found behind the Key Largo Limestone reef, but overlies it in the western extent of the keys. It consists of a bryozoan facies and an oolitic facies and represents a subtidal shoal. Additionally, excellent examples of Holocene carbonate-sand deposits are found in the Dry Tortugas, consisting mainly of disarticulated Halimeda plates. Between the Dry Tortugas and Key West is a 12 m thick example of these sand deposits, known as "the quicksands". Visitation steadily rose for several decades, reaching a peak of 83,704 in 2000. Since then visitation has slowly declined, with an average of about 63,000 per year in the period from 2007 to 2016. REDIRECT Template:Em dashtropical ecosystem, hosting species that do not normally breed in, and are not commonly found anywhere else within, the continental United States or the islands and waters surrounding it. Dry Tortugas National Park Facts for Kids. Kiddle Encyclopedia.